If you’ve been wanting to go camping, now is the time. This Modern Camping Checklist will give you the knowledge of everything that you need to pack! It is now the perfect time to go on a camping adventure. With the weather staying warm, rain to a minimum, and school getting ready to start, a weekend camping trip is a great way to end the summer. If you want to make the most out of your trip, you will want to make sure you packed all the essentials. 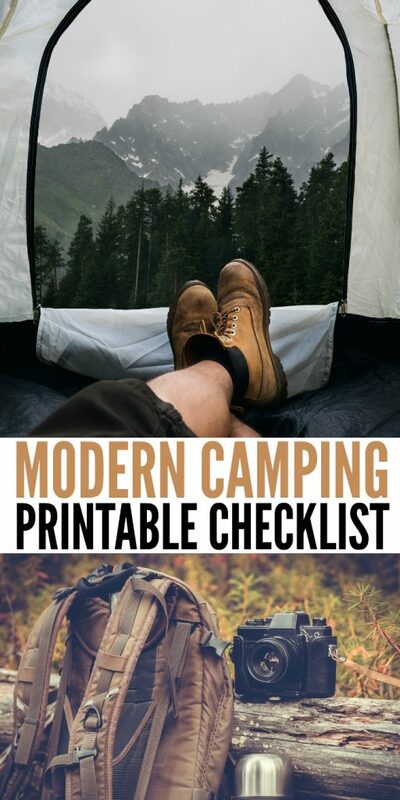 Here is a modern camping checklist to help you out! These items are important for every camping adventure! If you’re planning on venturing out and exploring Mother Nature, this camping checklist is one that needs to be on your radar. Not only does it give you a good basis for must-have items to pack, but it also helps make certain that you remember everything that you could possibly need or want! You never know when the weather is going to change and Mother Nature decides to throw you for a loop. These camping must-haves will keep you ready for the best possible camping trip ever! Never forget your toilet paper. It is a no brainer that camping doesn’t stop nature from calling. Keep your toilet paper in an old coffee can keep it safe from the weather. Bring extra layers. Sweatshirts and sweatpants may not seem like a necessity, but when the sun goes down, it can get pretty cool out in the wilderness. Take a poncho. Mother nature can be a little sneaky from time to time. Bring a poncho because you never know when it will decide to rain. Two pairs of shoes. If it rains, you will need an extra pair of shoes in case your others get wet. Bring two sets of tennis shoes or boots. Grab your bug spray. You will want lots of bug spray when you head out into the wilderness. Spray your tent before nightfall to keep them away while you sleep. Flashlights and lanterns are a necessity. Though days are longer, when the sun goes down you will need light. Don’t forget your flashlights, lanterns, and extra batteries. Bring two coolers. Use one cooler for your drinks and the other for your food. You don’t dirty fingers from the day in your food. Take something to lay on. The ground is rough out there, so bring an air mattress, cot, or mat to sleep on instead of the ground. Invest in an extra tarp. An extra tarp can be hung to give more shade during the day as well as provide an extra layer of protection from the weather. Tents and sleeping bags are always a basic necessity unless you really want to rough it. Pillows tend to get forgotten. Remember to bring your pillows for a restful night’s sleep. Grab your cooking supplies if you plan to cook. You will need pots, pans, plates, silverware, knives, serving utensils, cups, and anything else you normally use to cook. Bring your own trash bags. You want to leave mother nature the way you found it. Clean up your mess before you leave by having trash bags available for your trash. Make sure to prepare for any type of weather. Pants, shorts, swimming trunks & suits, socks, underwear, long sleeves, short sleeves, and everything in between should be packed. Take your foldable chairs. Unless you plan to sit on logs, you will need some chairs to sit around the fire at night or during the day. 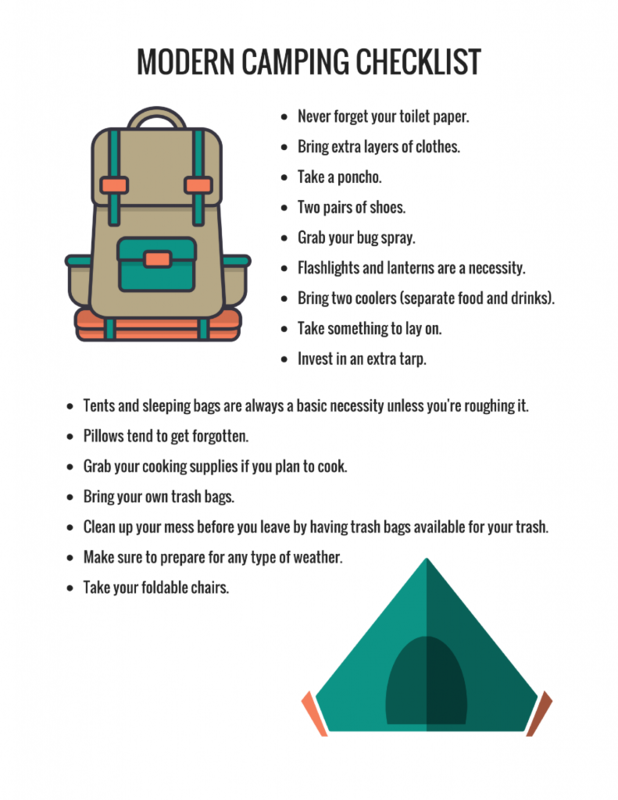 Grab your printable version of this Modern Camping Checklist! When it comes to roughing it in the outdoors, you want to be prepared. What other items would you suggest bringing on a camping trip? What items would you add to this modern camping checklist?